Description: An ornate Hand-forged metalwork design combined with Clear Seeded glass and Ruby, Topaz, Sapphire and Emerald colored glass jeweled accents create a rich, luxurious look. This high-styled wall fixture features charming scrolled accents and a complementary stylized arm and hardware, which are featured in a Gilded Tobacco finish. This sconce is ideal to complement a variety of architectural styles for today's exteriors and interiors. Custom crafted in Yorkville, New York, this fixture is offered in custom sizes, finishes and styles, as well as energy efficient lamping options. 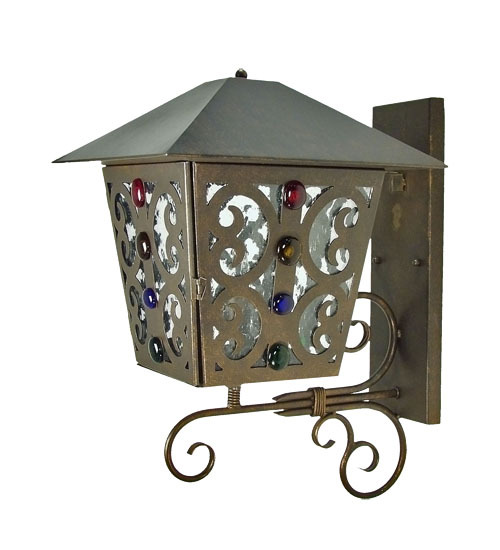 The 26-inch tall sconce is UL and cUL listed for dry, damp and wet locations.